on Friday at PAF Ski Resort Naltar, Gilgit-Baltistan. According to information received here, Pakistan Army’s Abdul Jan got gold medal in giant slalom category of National Ski Championship. He was followed by M. Iqbal of Pakistan Army and Liaquat Khan of Pakistan Air Force (PAF), who claimed silver and bronze medals, finishing second and third, respectively. In slalom category, Army’s M. Iqbal stood first to earn gold medal, while PAF’s Liaquat Ali and M. Abbas got second and third positions to take silver and bronze medals, respectively. 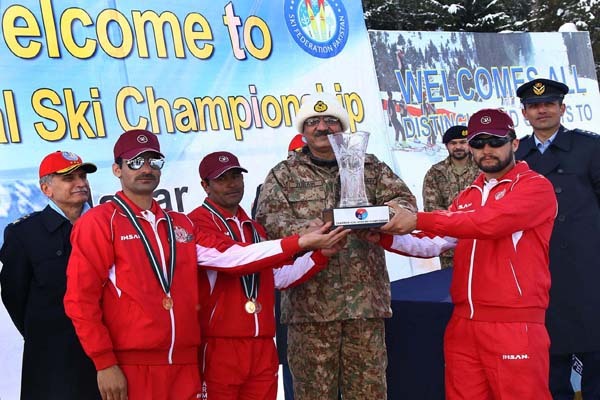 In the Chairman JCSC Championship Army’s Abdul Jan and M. Iqbal claimed gold and silver medals in the giant slalom category by finishing second and third, while PAF’s M. Abbas got bronze medal as he remained third. In the slalom category of Army’s Zia Jan took gold medal as he clinched first position. He was followed by Army’s Abdul Jan and PAF’s Sarwar Khan, who remained second and third to earn silver and bronze medals, respectively. Earlier on Thursday defending champions Gilgit-Baltistan Scouts (GBS) lifted Shah Khan Ski Cup at the same venue. Waqar of GB Scouts claimed gold medal in slalom category, while Feyaz Alam of CAA won silver medal. Bronze medal was clinched by Ali Syed of GBSA. Waqar also earned gold medal in giant slalom category, while CAA’s Feyaz won silver medal in the same category. Army’s Jan Alam took bronze medal. Chairman Joint Chiefs of Staff Committee General Zubair Mahmood Hayat was the chief guest at the closing ceremony. Vice Chief of the Air Staff, Pakistan Air Force Air Marshal Asad Lodhi who is also President Ski Federation of Pakistan (SFP) accompanied the chief guest. They witnessed skillful display of skiing by the athletes. The chief guest distributed trophies and awards among the winners. Speaking on this occasion the chief guest appreciated the efforts of the PAF and Ski Federation of Pakistan (SFP) in promoting the sport of skiing in country. He especially lauded the PAF for extending its facilities at Naltar and Kalabagh for nurturing this exhilarating sport. Skiers from various Ski associations of the country participated in the championship in temperatures below freezing point. A large number of spectators and ski lovers from all over the country came to witness the championships.